Scores of people said to be missing after flash foods hit the remote Baghlan province. Afghans look for their belongings in their house damaged after flooding in the northeastern Baghlan province, north of Kabul. RESCUES ARE SCAMBLING to deliver food and medical supplies to Afghan families marooned on mountaintops after flash floods killed 80 people in a remote northern district, washing away hundreds of homes and forcing thousands to flee. 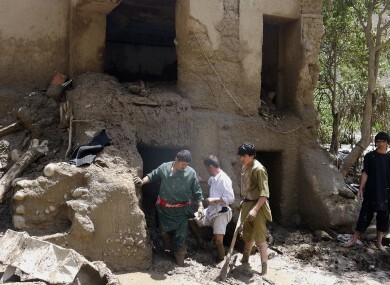 The death toll was expected to rise, with scores of people said to be missing in the mountainous district of Baghlan province after torrential rains unleashed the floods on Friday. Television channels relayed footage of one man wading through a gushing stream of muddy brown flood waters, his back stooped under the weight of a burlap sack. Baghlan police spokesman Jawed Basharat said the death toll had climbed to 80. The Afghan army, he added, was battling to deliver aid to the affected families, many of whom have fled to mountaintops to escape flood waters. Afghanistan’s defence ministry had dispatched two helicopters to deliver aid packages to the area as roads and mountain passes were left devastated by the floods, said Obaidullah Ramin, an MP from Baghlan province. “Some nine kilometres of roads were destroyed by floodwaters, so officials are trying to deliver aid by air,” Ramin told AFP, confirming that 80 bodies had so far been recovered by authorities. Relief agencies have distributed some aid, but it is not enough. The problems of the flood-affected people need to be addressed fully. Most disaster management officials were difficult to reach Sunday due to poor telecommunication networks in the remote area. The governor of the province, Sultan Mohammad Ebadi, warned the extent of the disaster was “massive”. Bodies of women and children were among those recovered from the inundated areas, the National Disaster Management Authority (NDMA) said, adding that scores of people were missing. “There is a lot of stagnant water, and there are more bodies under the rubble and mud,” Mohammad Nasim Kohzad, head of NDMA in Baghlan, told AFP. “The floods destroyed four villages, and washed away 2,000 residential houses, agricultural fields and also killed thousands of cattle,” Noor Mohammad Guzar, the governor of the remote affected district of Guzargah-e-Nur, told AFP. Officials were further assessing the extent of the damage on life and property in the affected area, Mohammad Aslam Sayas, the deputy head of the National Disaster Management Authority, said. “Our teams have also provided some edibles (food items) and medication to the affected people. More aid will get there soon,” he said. Outgoing Afghan President Hamid Karzai in a statement said he was saddened by the loss of life and property in Baghlan province, and directed disaster management officials to dispatch emergency relief aid to affected families. Last month a landslide triggered by heavy rains buried a village in a remote area of northeast Badakhshan province, killing at least 300 people. Email “Rescuers battle to aid Afghan flood victims as death toll hits 80”. Feedback on “Rescuers battle to aid Afghan flood victims as death toll hits 80”.